If you’re concerned about your health, you should probably avoid products that make health claims. Why? Because a health claim on a food product is a strong indication it’s not really food, and food is what you want to eat. For a very long time, I've been fascinated by Michael Pollan. I've wanted to read some of his books - I sometimes pick one of them at a bookstore aisle and read passages while I'm there. But the idea of reading a very subjective research-oriented book was a bit daunting for me, no matter how intriguing the subject matter. Lately, I seemed to have found a solution for such books - listen to them! My library had only one audiobook (what a pity) and so I picked this one and started listening to it, waiting for some magic to happen to my food thought process. In In Defense of Food, Pollan advocates eating real food (food that is as close to its original incarnation as possible). He wants us to toss out all those brands we see calling our names in the supermarket aisle, which are not really foods, but something produced industrially. He quotes bread as a popular example - the ingredients label of most brands has 20+ ingredients when you can make bread with under 5 ingredients. In fact, 5 is his magic number - he prefers to avoid anything involving more ingredients than that. 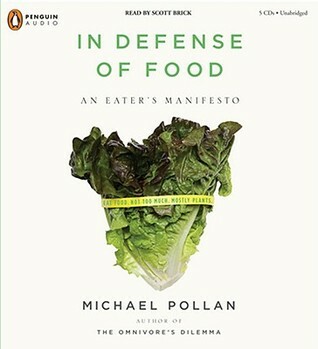 In the first part of In Defense of Food, Pollan talks about how we have reduced diets from the concept of eating foods to eating nutrients. How everything is about carbs, proteins or trans fats or zinc. How people have begun to stop looking at a food as what it actually is but instead is looking at it as say, 50% carb + 10g protein. I have to admit, I've been on that bandwagon too. Even after reading this book, it's hard to stop thinking nutrients and start thinking whole foods. On the other hand, it is quite reassuring to be told to stop thinking in terms of nutrients - there are too many of them and who wants to track them on a daily basis? I enjoyed listening to In Defense of Food, even though I knew about a lot of the information he shared. This book was originally published in 2008, and five years later, the status quo now is the same as, if not worse than, it was then. In addition to reading book blogs, I read a ton of food blogs (as probably many of you do too), and some of my favorite bloggers are those who make an effort to cook yummylicious dishes with healthy ingredients. Not that I'm so disciplined - I do go for the occasional (or maybe more than occasional) treat by indulging in my guilty pleasures (who doesn't love pizzas and icecream?) but on the whole, I try to stay on the healthy side. So when Pollan shared a ton of strategies to help the reader choose a healthy food over a non-food item, I realized that many of them are much-advocated tips today. That said, I did learn a lot from this book. Mostly, it made me even more watchful of what I put into my mouth and more aware of what to look for when I decide to buy or eat something. Honestly, it's very hard to step away from all the processed foods around you when they have been drilled so hard into your brain. And besides, who doesn't like to stock up on canned foods for those days when you have PMS and would rather eat junk than labor on to make a good meal? The husband and I love eating at restaurants and if one more person tells me that I can eat salads for dinner, I'll choke. I love salads, but I won't exactly spend $$$ for them at restaurants. The last section of this book focuses mostly on ways to make the right decisions where food is concerned. I liked his strategy of walking along the contours of a supermarket to get real food (dairy and produce are usually along the edges). If you have been eating well for a good while, you probably already follow many of his ideas and this book may not exactly be enlightening for you, but if you are looking for a book that can set you on track for healthy eating or if you are looking for some motivation, then this book will satisfy that. About the narrator: I had previously listened to a few minutes of another book that Scott Brick narrated. I couldn't continue with it because I found Brick using too many inflections and tones during narration, and almost sounding very lazy. However, in this book, Brick did a good job. He still had traces of those over-inflections but on the whole, he was the perfect narrator for this book. How do you approach your food? I haven't read this book but I do like his philosophy. I try to eat healthy but do succumb to temptation more than I'd like to admit. I would enjoy this book, although I think books like this tend to preach to the choir i.e. only people interested in eating better would pick them up. Salt, Sugar, Fat is good too. I haven't read anything by Pollan yet so I may give this one a try. I try to be more mindful or what and how I eat, but there's temptation everywhere. I have this one on my TBR shelves and I need to read it. I was a huge fan of Animal Vegetable Miracle by Barbara Kingsolver and I think I'd really enjoy Pollan as well. This sounds like what we all know we should do, but don't always. I love that my town has a farmer's market every day in a different part of town so that we can buy fresh fruit and vegetables whenever we need to!